I picked up fishing at an early age and since then, I was pretty much hooked. I did all different variations, starting from freshwater bass fishing to bottom fishing or trolling for salmon. Still, my favorite so far is certainly fly fishing. There is something special targeting fish that you can clearly see while practicing sight fishing, and nothing beats the fight of a decent fish on a fly fishing rod. There are an overwhelming amount of products to choose from and I had the chance to test quite a few so far. A friend of mine owns an outdoor shop, so I always had to listen to a lot of advice before picking mine. Therefore I will give you a quick review of my favourites and in my opinion best wading staffs. Further down I will also explain the up and downsides of different models. Although a bit pricey this is one of the products I have for a few years now and even today it performs as well as when I bought it. It is lightweight, fully adjustable in size and comfortable to hold in your hands. I often use this wading staff, when I know have to hike a few miles for my fishing spots. 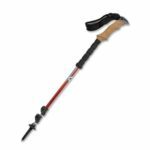 It performs equally good on land than it does in the river and could easily be used as a full-time hiking stick. As mentioned earlier, the size is adjustable and you can choose everything between 29 inches and 57 inches. A bonus I only noticed after using it for quite awhile is, that you can unscrew the cork knob and use the wading staff as a camera mount. First of all, I would have never thought about buying this stick for myself in the first place. I usually believe that get what you pay for and I honestly would not have expected to get something decent for that price. I do not own this wading staff but a friend of mine does and when we were fishing at a local river together, I had the chance to try it out a few times. It feels solid and did its job. I doubt that it has a longevity comparable to well-known brand products, but it will certainly serve you well for a few seasons. Fully extended it is about 52 inch long and folded it takes up only 12 inch, which is really small. Not much more to say here, it does not come with a fancy handle or some luxury extra features, it just does what it is supposed to do: support you in the river. I do not expect more from gear in this price range and if you have a tight budget, I can honestly say that this is the best wading staff you can get for under 30 bucks. Probably my favourite of all wading staffs I ever used is the Orvis Black Diamond Trail Back Staff. The price is decent and after two years of constant use, I am tempted to say that I do not see me buying a replacement for at least another five years. Folded it is only 25 inch long and the usable length can be everything between 27 inch and 55 inch. Even fully extended it feels completely stable and once secured it is almost impossible to fold it by accident, which was always really important for me. It only weighs slightly above half a pound hence it is really lightweight and barely noticeable in a pocket. The grip is made from non-slip rubber and a nylon webbing strap makes sure you do not lose it in the river. Once again, If this is in your budget, this is the best wading staff you will get for that money. Even though I own a more expensive one, the Orvis Black Diamond is my everyday carry, as long as I fish at least. The S-Class under the wading staffs. Really popular choice for fly fishing guides and a few of my friends swear on this one. I never owned it myself but borrowed it several times for a few fishing days. Folded it is only 10 inches long and the smallest wading staff I ever held in my hands. The size itself is not adjustable but it comes in three variations to choose from (41”, 51” and 59”). The included sheet can be attached to a belt where it does not need much more room than a knife and with 16 oz is also pretty light. 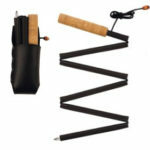 The cork grip lets this wading staff float, which can certainly save you 170$ in some situations. This thing feels as quality made as you would expect it to be for something in this price range. A grip to use it as a camera mount is available as well. This definitely a high-end product and if you have the money and feel like spending it, by all means go for it. This staff will probably last you a lifetime. The four options I reviewed here are in my opinion the best in every price segment. There are differences in quality and I would not compare the cheapest one to the most expensive one shown here. It just depends on your budget and what you want to spend. All three will do their job in the river, the main difference is probably in how long they will do it. 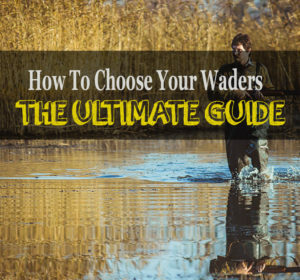 Yes, you can spend way more on a wading staff, but why should you? There was not one situation in the river where I thought “damn, I wish I would have spent twice the money on my wading stick!”. Although a wading staff is an important piece of gear for me, I do not feel like spending unnecessary amounts of money in this area, I would rather get a few new flies. A big part that definitely adds a lot to the fact that I like fly fishing so much is how close you actually get to the fish. Standing only a few meters away from your “prey” completely changes the feeling of fishing for me. In most cases, this is only possible if you are wearing waders and one accessory that I do not want to miss anymore in a fast flowing river is a decent wading staff. While I agree that it can be slightly annoying to carry another piece of equipment around, the benefits of using one definitely justify that. We all have been there. Standing in front of a deeper looking pool, not sure if the next step really is a good idea. Mossy rocks can be slippery, even with the right wading boots. Even when you wear a wading belt, falling in the river can be life-threatening and is something you want to avoid at all costs. If you carry a wading staff and use it correctly, this risk can be greatly reduced. When you can not see the bottom of the river, every step could make you lose balance. The water could be deeper as expected, you could step right into a gap or you encounter mossy rocks that won’t give your boots enough traction. A wading staff gives you the opportunity to test the area in front of you, while you remain in your safe position. You can easily check the depth with it and once you found a good spot, your next step will be much safer. Additionally, you can cross bigger gaps easier by anchoring the wading staff on the opposite site and use it as an artificial third leg. There are many situations in which a wading staff can save your from tripping over and therefore potentially save your life. As mentioned before a wading staff lets you move safely through the river. At the same time, this reduces the risk of fast and loud movements that could occur while you have to react to misplaced steps you took. Freshwater fish like trout are incredibly sensitive to those movements resulting in lower for you to catch them. A wading staff lets you move upright, slowly and controlled and therefore it will be easier for you to approach your target area unnoticed. Less slipping means less splashing and equals in less noise that could reveal you. Wading staff come in a few different variations. 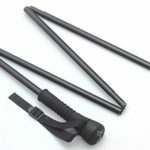 Although there are wading staffs that are static, meaning you can’t change their size or fold them together, collapsible wading staffs are far more popular today. These are the two major systems you can choose from. The big advantage of this kind of wading staff is how small you can fold it together. The number of separate pieces can vary. Some are only made from for parts like you can in the example picture, other are made from five parts or more. Obviously, the more parts the staff has, the smaller it will be once collapsed. I saw full sized wading staffs folded down to pocket size, which is definitely a nice to have feature. Although even in shallow a wading staff will benefit you, sometimes you just don’t need one and it’s certainly handy if you can just store it in a pocket or even on your belt. Unfortunately, this also brings a downside with it. If the wading staff gets stuck on the bottom between rocks and you try to get it out with a quick pull, the staff could disassemble itself. In this situation you might have no other choice than pulling the bottom piece out on the rubber rope it is attached to. This usually only happens with cheaper products and brands like Simms found ways to prevent this from happening, for example by using stainless steel instead of rubber to connect the pieces. Another disadvantage is that they often, but not all of them, lack the feature of an adaptable sizing. A too short or a too long wading staff can be annoying and if you can not find the perfect right away, you might have to choose the second option described below. The other fairly popular version is the one you can see on the left. It is completely variable in size and therefore perfectly adapts to your needs. If the clamps are fastened properly, it will be as stable as a static wading staff. In my experience, this model is usually more durable as well. One thing you could complain about is that even folded up it won’t reach the small size of foldable models. They also tend to be slightly heavier. Still, if you fold them up as far as possible, they come fairly close to their counterpart and it always was small enough to be carried comfortably. I am a fairly seasoned fisherman by now and I basically rely on wading staffs during the last few years. Let me tell you if I would have known how much more safe you feel walking with an “additional leg” I would have used one way earlier in my life. I think my next one will actually be the Folstaf. Time to treat myself. Thanks. I broke my ankle a few years ago so now will only fish with a staff. I am planning a NY fly fishing trip so will buy one soon. Great reviews! Thanks for your comment Steven! Enjoy your trip! Thanks for the review. I have been using a plain old sapling for a wading and hiking staff however its time to upgrade. This helped a lot. Anyone who fished or traverses rocky areas and streams should carry a staff especially if you fish alone. One fall and you can break a leg or worse and be stuck in the backcountry with no way out but to crawl. The major problem with collapsing ones are that they can get impossible to dissamble since water and air makes the pieces stuck. Has happened to me with two different models.